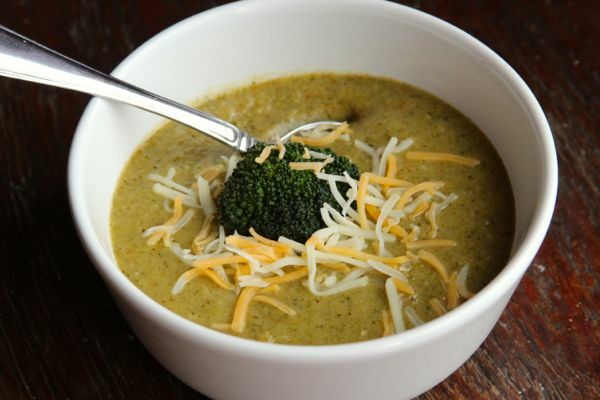 This slimmed-down, healthy broccoli soup is the perfect antidote to a dreary, chilly winter day. And just maybe, it could very possibly convert a non-broccoli eater. This recipe is also kid approved though my youngest has renamed it “Cheesy Tree Soup” since he refers to broccoli florets as trees (hey whatever works!). 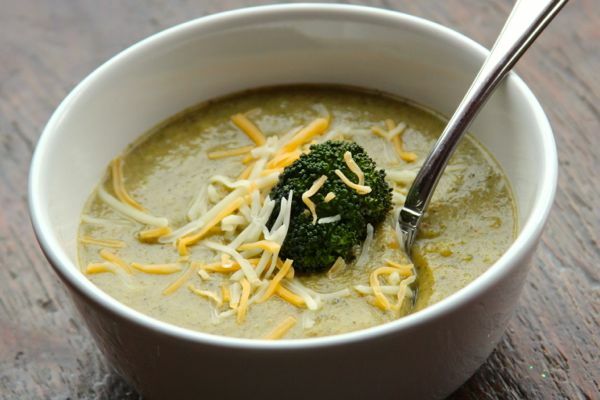 Most broccoli and cheese soups are loaded in calories and are quite high in fat given the addition of butter, oodles of cheese and cream. In this recipe the broccoli is roasted to enhance the overall flavor and add depth. Potatoes are used to help thicken the soup and Greek yogurt (or sour cream) is used at the end to finish the soup and give the soup its creaminess. Just a quick word of caution if you are going to use the Greek yogurt – Don’t put the yogurt in when the soup is on high heat and never let it boil completely. Once cooked, do not cover the hot soup until it has cooled completely as this could cause the yogurt to curdle. But don’t let that scare you away from using it – adding the Greek yogurt is creamy and it also adds protein. This soup is coziness in a bowl – warm, thick, creamy and healthy too! Broccoli is packed with nutrients including vitamin C, vitamin K, vitamin A, folic acid, calcium, and fiber. Broccoli is also rich is anti-inflammatory phyto nutrients. This recipe rebuild has a complete makeover and tastes just as good as the original recipes out there. Garnish: An extra roasted broccoli floret, sprinkle of cheese. Preheat oven to 425* and place florets and a large baking sheet. Drizzle the florets with 1 tablespoon of olive oil. Roast for 10 minutes until florets begin to darken and are slightly tender. Meanwhile, in a large soup pot, heat the remaining 1 tablespoon of olive oil over medium-low heat. Add the onions, garlic, carrots, celery and potatoes. Stir and sauté until the vegetables begin to soften about 7 minutes. Add the nutmeg and crackling of salt and pepper. Next add the broth and the broccoli. Reduce heat to low and cover for 15 minutes. At any point you can add up to 1/4 cup water if the soup is getting too thick. Remove the pot from heat and puree with a handheld immersion blender. Alternatively you can puree the soup in batches in a blender and return to the pot. Add the cheese to the pureed soup and stir well until the cheese is melted. Stir in the yogurt or sour cream until well blended (this step can be omitted completely).